OK, so first of all, the amounts are approximate; you’re making dinner, not baking a cake, so experiment and take a risk. Too much olive oil is better than too little. It’s sort of the ‘sauce’, so it shouldn’t all get absorbed. Boil a large pot of water for the pasta; add salt (~ tsp) and veg. oil (~tblsp). Prep all the ingredients before you add the pasta to the boiling water. You’ll cook the pasta on a high boil, uncovered, stirring often. Follow the box directions for the number of minutes to cook the pasta al dente. With all the ingredients prepped, it’ll take about the same amount of time to cook the pasta as it will to cook everything else. Toast the pine nuts in a cookie tray close under a broiler before you cook anything else so you can give them your full attention. They go from perfect to burnt in about 30 seconds. Toss them around occasionally as they are toasting. When they’re done, remove them and set them aside. Once the pasta is in the pot for 4-5 minutes, heat the olive oil over high heat in a large sauté pan or wok. When it’s hot but not smoking, add the garlic. After 30 seconds, add the broccoli and toss/stir for 2-3 minutes. (If you like softer broccoli, you can “blanch” the broccoli for 30 seconds in the boiling pasta water (before adding the pasta) by lowering the broccoli into the water using a colander.) Sprinkle with half of the herbs and some salt/pepper. Then add the sun-dried tomatoes and the pine nuts. Sauté for about a minute. Add the shrimp and sprinkle with the rest of the herbs. Toss everything often and sauté for no more than 3 minutes. The killer is to overcook the shrimp – don’t. You can slice one lengthwise to check for doneness toward the end. 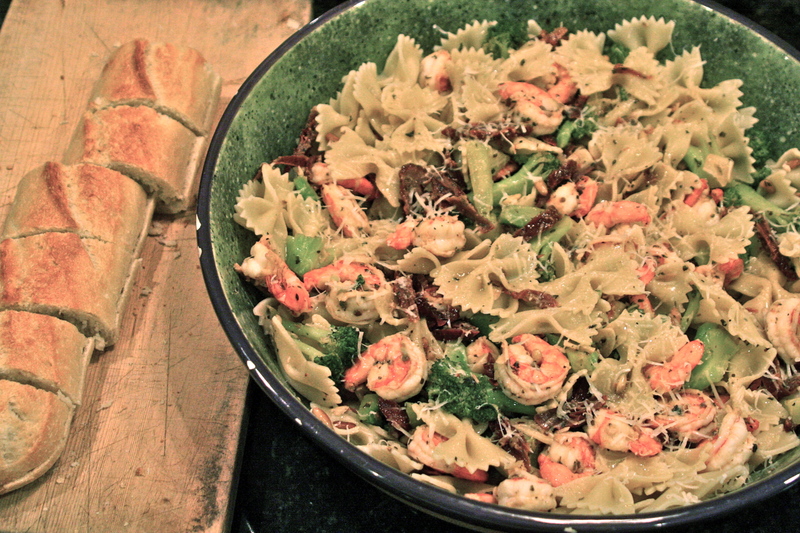 Better to have the pasta done early and be waiting for the shrimp than the other way around. By now the pasta should be done. If it’s not, turn off the heat over the shrimp etc., so it doesn’t overcook. When done, drain the pasta, turn it into a big pasta dish, or you could mix it right into the shrimp/broccoli mix if the pan is big enough. Otherwise (if you’re using a pasta bowl), pour the shrimp/broccoli mixture over the pasta, mix quickly, add about half the Parmesan and mix again. Reserve some Parmesan for the table to add to each person’s dish. This should serve about 4. If you’re cooking for one (just sayin’), halve the recipe and save the rest for leftovers.